It’s time to look at one of those terrible shock value films. The very premise of the film tells you all that you need to know about it’s quality and potential. There was never really a chance that this could be a good film and so you’ll have to be ready to endure this experience if it happens to be on. The plot involves a girl named Sarah who used to be an expert horse rider but then she had an accident and lost her sight. She is trying to get used to this situation and finds herself back in the home that she once grew up in. Just as life is getting back to normal, her family is murdered by someone and Sarah must now try to figure out how to stop him while blind. Get ready for a lot of scenes where nothing happens. Right away you can see why this plot is no good. There is no realistic way that someone who recently became blind, the lead is still getting used to this new way of life after all, is going to do much against such an accomplished murderer. She needs a lot of plot convenience and the villain making all of the wrong moves to survive. The villain had numerous chances to destroy her but failed to do so. Due to who the culprit ultimately was perhaps he decided only she would be spared but it’s a huge stretch since that doesn’t seem to bother him much at all later on. I also don’t see how the villain left anything at the house considering that it was in an obvious spot and really couldn’t be missed if you can see. All in all, I wasn’t buying it. Then it seems like the movie was filmed while everyone was finishing up a sprint because the characters are constantly out of breath for no real reason. Scenes like this feel like filler for sure. Then you’ve got numerous scenes which are basically just the heroine crying or panicking. Scenes like that don’t advance the plot and get real repetitive real fast. At most a scene like that should happen once but after that it’s time to take charge and get out of this situation. There’s nothing particularly fun about the film. We do get scenes with happy music to try and show how oblivious the lead is but those scenes are just being intentionally morbid. Then to keep you guessing on who the villain is, most of the characters are just mean or unlikable. Some are downright criminal. You’ve got the groundskeeper who seems to be a threatening guy who doesn’t like other people and resents that a horse died because of the main characters. Then you’ve got the right hand man of the main guy who keeps taking dirty looks at the main characters and in general has a bad attitude. There’s also the two people from this little pop up trailer who don’t mind kidnapping and possibly murdering people to get themselves out of a situation. Although, despite the many red herrings I do think the film tipped its hand on who the villain would be. In these kind of edgy films it’s not enough for the villain to be a mass murderer, he has to be depraved as well. As a result, you will be able to deduce who it is from that fact. There’s only one character who appears early on that has this trait. Back to the premise, Sarah is way too adept at moving with high speeds. She’s practically skipping through the house and of course we can’t forget how she is still able to ride a horse while blind. You’re going pretty far on a horse so bumping into something is basically inevitable. These things were done to give her a fighting chance but even then she realistically doesn’t stand a chance. Naturally this film is on the violent side so watch out for that. It’s nothing too crazy but everyone basically bleeds out and there are quite a few dead bodies on the scene. It’s mostly for shock value again as I can’t stress enough how the villain’s plan doesn’t make a lot of sense. I’m still having a hard time figuring out why he didn’t finish the main character along with the others. Or at least finishing off Barker so he couldn’t warn the lead. I understand the motive but the guy seems like he really didn’t think things through. Then we’ve got the romance plot thrown into the mix. The main guy does nothing wrong, in fact you could make the case that he’s one of the best characters in the film. He seems nice enough and he looks out for Sarah. He even does try walking her home a few times only to be stopped by her. The film just makes sure that he isn’t around to help until the end so he doesn’t play a big part for a while. I don’t think we really needed to add so many plots to this film especially since the happy contrast doesn’t work since you already know what has happened at the house. 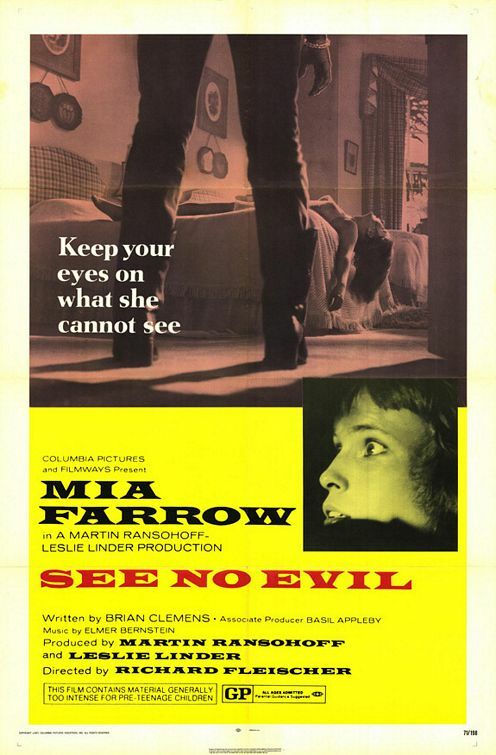 Overall, See No Evil is definitely a film that you will want to stay away from. It’s as overly dramatic as you can get and never does anything to make itself stand out in a good way. The film is rather dark and violent the whole time so when the film finally ends there isn’t much of a triumph. Most of the characters are already gone so they can’t take part in the ending. I definitely recommend avoiding this film and watching something else for thrills, like Mission Impossible. This entry was posted in Live Action Movie Reviews, Live Action Movies, Reviews and tagged Blind, Film Review, Horror, Movie Review, Murders, Review, See No Evil, Shock Value, Thriller by dreager1. Bookmark the permalink.